More photos coming soon. Photos displayed will be similar to the final construction and décor. If you love coming to the Outer Banks but are looking for a brand-new rental, we’ve got the home for you! Fairways & Seaspray is perfect for your next family beach vacation or family event. 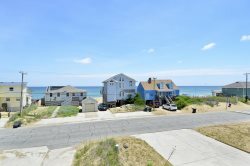 * Just one-tenth of a mile away from the nearest public beach access on Bleriot St., the whole family could be enjoying fun in the sun with a short 3-minute walk across the Beach Road. A carport beneath the house and elevator access to all 3-levels makes loading and unloading your luggage a breeze. Outside, a huge fenced-in yard contains a 16’x16’ square concrete pool for your family to enjoy a fun game of “Marco Polo!” To relax, take a dip in the bubbly Hot Tub beneath a pergola. Inside, the ground-level features a huge recreation room where your family will love playing a round of billiards at the pool table. A small kitchenette with full-sized refrigerator is the perfect place to prepare pool-side snacks. A full-size bathroom is accessible from the hall and a nice-sized Bunk Bedroom completes the level. Main entry to the home is through the covered porch on the main floor. Rest easy in one of two (2) Master Queen Suites with attached full-sized bathrooms or one of two (2) Master King Suites with attached full-sized bathrooms. Each bedroom is spacious and comfortable with plenty of bright, natural sunlight. The laundry room is also found on this level. A covered back deck is the perfect place to enjoy the ocean breeze while staying out of the sun. Upstairs, your family will love hanging out together around the flat-screen TV in the great room with cozy furniture, nautical décor and gorgeous ocean views. The fully-stocked kitchen features a convenient and sleek design, stainless steel appliances and a large island bar. Sit down as a family and enjoy a gourmet-seafood dinner around the dining room table and then step outside to either the front or back deck to enjoy gorgeous sunrise and sunset views. A half-bath is located off the great room area for convenience. A final King Master Suite is located on the top-level and features an attached full-size bathroom and deck access. Take advantage of the convenient location of this gorgeous oceanside rental by checking out all of the nearby restaurants and attractions. Art’s Place is one of the best burger joints on the island and is within easy walking distance. Less than three-tenths miles away, Ocean Boulevard Bistro and Martini Bar offers tasty seasonal seafood entrees and drink specials at the bar. When you need supplies, you are within a short driving distance of a Walmart Supercenter and Food Lion. Don’t forget to try your luck at Sea Scape Golf Links – 2 rounds of golf are included with this rental! For nature enthusiasts, nearby Kitty Hawk Woods Coastal Reserve is a great place for hiking. With its close proximity to the beach, you’ll love making Fairways & Seaspray the spot for your next family getaway! *Hosting an event? This home includes unique Event Home Features: Ground Anchors for Tents, Outdoor Wiring, 2 rounds of golf per week at Sea Scape Golf Links, Gated Yard Opens up to #4058 and #4059 which can also be rented for large event space. Click here to read more about the Lindbergh Event Homes.